We might not always have a solution, but our goal is to give you the ultimate tool to develop your diving career or your business. In order to do so we have summarized the answer to most of your questions here. We believe in changing the way things are done, and as a result you should not pay for basic services that you can find other places. If you for example only need access to the diving tables, that’s free through the DiveGuard app. However we as all other companies need to generate income in order to improve our service, upgrade and develop new functionality. Hopefully you see the value of the additional stuff we have created and find it useful. Depending on the membership model you select this will determine functionality and user experience. Check our Pricing Plans to find the most suitable model for you and the prices. Which dives count in the ranking? Only the dives where you are the Diver will count. The dives also need to be verified in order to be counted in your ranking. In Cloudiver one of the really cool functions is our rating system. This is your own personal indicator while you develop your career. You might say that there is a childish style to it, but we think it is a useful tool for contractors to find the right man for the job. The ranking system will make it possible for contractors to easily see the difference between divers experience, such as for example a contractor looking for divers for a 30 meter depth project will easily see the difference between a diver with over 200 air dives at 30 meters and one with 400 dives at 10 meters. Of course we are not able to include personality trades for each diver, but we believe the combination of recommendations from others, the ranking levels and the divers own virtual CV will give contractors just as good a picture as any text in an e-mail. The ranking may also provide useful for determining who in your projects has the most experience, need a rest or to increase productivity. Can I change my ranking? The ranking is done automatically based on the dive logs generated from use of the DiveGuard application or those uploaded by yourself or a company manually through Cloudiver. For this same reason, it is not possible to change or modify the level without adding more dives to your history. Can I share my ranking? Why doesn't my ranking levels change? To increase from one level to the next, you need to improve your experience and perform numerous dives, and the more experienced you get the harder it will be to improve your rank. We have done it this way to make it possible to differentiate divers even when they have years of experience. But don't get depressed. Keep diving and you will see that your rank improves. The ranking system builds on a special algorithm to decide your score level as a professional diver depending on key factors such as depth of your dives, bottom time, number of dives and recommendations. Using the DiveGuard application to run a dive will automatically generate the information, but the algoritm works for dive logs that are uploaded manually through Cloudiver also. However please remember that only verified dives count. The score you have obtained is used to select the current level from a scale of "nicknames" in the two categories (Depth, Number of dives). Based on the score in each category you will also be awarded up to 5 stars. In the final Category (Recomendations), this is something you will obtain from other users and friends such as your supervisors or co-workers. Each user can only give one recomendation (up to 5 stars), and based on these you obtain a score that translates into your level and the total number of stars. Your average score is finally calculated from a special algoritm designed to weight and evaluate your general level of experience. How do I change or upgrade my subscription? In order to change or upgrade your subscription you need to go to your Profile/Account settings. Here you will have the options to upgrade or change your type of subscription to the plan that suits you best. Why do I get notifications? If you receive notifications from Cloudiver it is because something new has happened related to your profile or the system, and in most cases something that needs your attention. This can be a new job offer, a request to verify a dive or a new applicant to a vacant position. The type of notifications is always depending on your profile. We will also send you notifications if there are special offers we believe that you would be interested in. We believe that the notifications is a useful tool in order to remember tasks pending in Cloudiver. However we do understand that such things are unpractical when going away on vacation etc. All you have to do is go to Notifications under your account settings and you can adjust it just the way you like it. If you really believe that Cloudiver has nothing to offer you and you wish to remove your profile you can do this under your Profile/ Account settings. Note: If you delete your account you will not be able to recover your data and your profile will be permanently removed. I have deleted my account but wish to start using Cloudiver, what do I do? If you have deleted your account you will not be able to recover your old data. You can of course create a new profile and input dives manually to rebuild your profile. What type of user titles exist? What is the difference between the titles? The main difference between a Diver and a Dive Supervisor or DiveGuard Supervisor is in the Cloudiver dashboard and the use of DiveGuard. A diver will only collect data and statistics for the dives where he is the diver, while a Dive Supervisor will also be able to see the statistics for panel hours where he was acting as the dive supervisor or assistant dive supervisor. Further a Dive Supervisor or DiveGuard Supervisor will have access to add divers to his profile in order to perform dives in DiveGuard. What are the title requirements? In order to obtain the title diver you simply need to create a profile. To become a Dive Supervisor (certified) you will need to upload documentation of such to your profile. Cloudiver does this process automatically and does not verify the contents of what you upload, but keep in mind that the contractor will get access and verify your documents later so uploading false info may result in you being banned as user. To become a DiveGuard Supervisor (Cloudiver) you will need to take the Dive Supervisor course in Cloudiver. How do I change my status to available? If you wish to change your status to available so contractors can see you are available for new projects or work go to Profile under the menu. Change your status by clicking on the icon next to your status in the top right corner. You will also automatically become available once you or a contractor terminate relationship or the contractor close a project you are part of. Can I be available at the same time as I am working for someone? Yes you can, by changing the status in your profile but we do not recommend it. Contractors may blacklist you if you appear available in the system and then when they go through the trouble of trying to hire you it's not possible. How does the contracting process work in Divejobs? There are two ways to for a diver to be contracted through our DiveJobs module. The first one is through applying for a job-offer, the second is through the list of available divers. At the time the diver choose to apply for a job-offer, the company will be able to see his full Virtual CV and profile incl. certificates etc. and based on this information they will decide to contract you or not. If an Enterprise/Company is browsing through the "Available divers" list and choose to contact you, you will be asked to give the same permissions for them to study your profile and Virtual CV and then provide you an offer. Remember that until you remove the connection with the Enterprise/ Company they will have access to your full profile and Virtual CV. If you wish to disconnect from a company click on "total companies" at the top of your dashboard, find the company and click disconnect. How do I create a job offer? If you wish to create a job offer you will need to go to the DiveJobs module. The easiest way is directly from the bottom of your dashboard selecting create new offer. Fill in required info and click save. Only Enterprise users can post offers. Can I remove a diver from my project if he quits? Yes, under your project you can remove any diver from the crew by clicking on the red trash bin under options next to the diver's name. How do I edit a job offer? Go to See my offers under DiveJobs directly from the bottom of your dashboard. Find the offer you wish to edit and push the edit button (green pencil icon) under options to the right side of the offer title. Can I remove my application for a job? How do I close a job offer? When you have all your crew, you can close the job offer, so new applicants are not accepted. Simply select your offer by choosing see my offers under DiveJobs on your dashboard, then click the close offer button. Do I still need to sign a contract with the company after accepting the job offer? Yes, We at Cloudiver only provide the means for contact between job-searcher and the one hiring through our DiveJobs portal. Terms and conditions that apply for the actual job must be agreed between the parties and Cloudiver take no responsibility for the contents, lack of contents or any other part of such agreements. How do I remove a job offer? In the same way as you would edit a job offer you can delete one. Go to See my offers under DiveJobs directly from the bottom of your dashboard. Find the offer you wish to delete and push the trash button (red trash bin icon) under options. We do however recommend to just close the offers when you have found you crew. Just in case you wish to go back and check who applied later. What information do I need to include in the job offers? We always encourage our users to include as much valid and correct information as possible in order to avoid confusion. Some fields are mandatory, such as title, project and country. The fields that are not mandatory we leave up to you if you wish to include such as salary conditions etc. Anyone with a Premium or Enterprise user can access DiveJobs. Who can post an offer in DiveJobs? Only Enterprise users have access to post offers in DiveJobs. In order to apply for a job click on the offer from the list of available offers and click on the apply button to the right of the title. How do I search available divers? Does Diveguard calculate when it is safe to fly? No, Diveguard does not calculate this. Can a divelog be changed later if I forgot to push the action button? Dives can be changed/edited later in Cloudiver by the Supervisor or Enterprise user if you have forgot to example click “arrived bottom” at the right time. A log of any changes is always visible in Cloudiver. Do I need to be connected to Internet to use it? If device is not connected to Internet it will not synchronize data such as N2 group, latest dives etc. Make sure to always use the same device for all dives if no internet connection can be established so that your divers data is updated locally on device. What does “Leave for stop” clock mean? The application follow the tables strict, which means that if you have put estimated time of your dive and your depth to a level that require decompression, this clock will appear. If you miss to click left bottom before your countdown clock (Leave for stop) hits 00:00 you will be asked to follow next table of deco stops. Does Diveguard adjust for Altitude or diving above sea level? No, the application does not apply altitude adjustments. Bottomtime counts from the time your diver leaves surface until he leaves bottom. Why do I need to fill in output data when completing a dive? For the same reason as when you start a dive it is important that some information is registered when you finish in order to complete the divelog. Does DiveGuard provide support for Surface decompression with chamber (SD-O2)? No, currently the application only support Standard Air diving tables and Nitrox tables. What is total dive time? Total dive time counts from the time your diver leaves surface until he returns to surface incl. any decompression time in water. Why is there no checklist for diver in DiveGuard? There is as many ways of doing checklists as there are contractors. Everyone does the checks in their own way and according to the equipment they use. We have therefore left it up to the Contractor to establish the checkpoints applicable for their equipment etc. and we have only included a button for verification once the checks has been done. Does DiveGuard provide support for saturation/bell diving? What does time to first stop mean? The time the diver spends from he leaves bottom until he arrives to his first decompression stop. Why do I need to choose activity level in output data? The activity level during the dive is vital in determining the health effect on the diver and his need for rest. If a diver has been cold during a dive or is particularly exhausted you also have the option of adding an extra N2 group as extra safety. Is it possible to run treatment tables through the DiveGuard application? No, currently the application only support Standard Air diving tables and Nitrox but you are able to view and read the tables through the "tables section" in the application. What happens to my dive if I change estimated time? Nothing will happen to your dive if you change this, and you can change it and switch between real time/est time during the dive to see if by extending the bottom time you will get decompression time. It is simply a function we have added so you shall be able to change and estimate table changes in your dive as it is progressing. How many divers can I use? At any given time or dive session you can have three divers at the same time in the water from the same device. Once one of these has finished his dive, you can replace him with a new one. This means that in principal you can run as many divers as you wish without closing the dive session. We do however recommend that you finish every dive session when natural pauses occur such as all divers on deck or lunchbreaks, shiftchange etc. Also remember that divers that is not selected and included in the set-up of the dive, will be given a new Dive Id number even if it is performed within the same dive session. Can I view tables in DiveGuard? Yes, all the tables we are using to calculate your data is available to view in the app. You can also view them while running the dive by selecting view tables from the top of your device screen. DiveGuard does not in any way aim to replace the tables or the book, simply make it easier to use them in practice. We still refer to the original books and tables for dive medical explanations of how and why the tables are formed the way they are. Our recommendation is that you always keep a copy available whenever using DiveGuard, and a notebook for taking notes during the dive session. What does max depth mean? Your max depth shall always be set to the deepest depth your diver has been at during his dive. Max depth is critical in order to decide the correct table to be used. When your diver is moving deeper you should always change max depth as soon as the divers depth change. DiveGuard has incorporated an alert that will remind you to adjust the max depth after 2 minutes from leaving surface and then every 15 minutes. It is important to remember that if the max depth is not set to correct depth, DiveGuard will calculate bottom time, decompression stops etc. from an incorrect table as well. How do I create new projects in DiveGuard? DiveGuard does not allow you to create projects, they need to be created under "Projects" in your Cloudiver dashboard. You will have to be an Enterprise user to create new projects. How can I add divers? 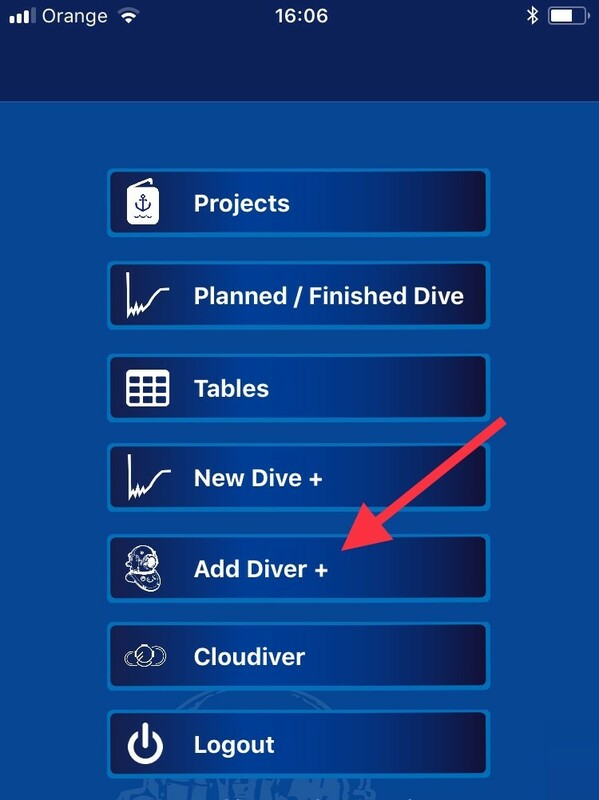 Yes, choose add diver, fill in the name and e-mail of the diver and he will appear in your divers list both in DiveGuard and in Cloudiver (Enterprise profile). Make sure you have the divers permission to do so. It is very important that you are accurate with name and e-mail as the diver might wish to save or merge the data in his profile later. If he does not have a profile he will recieve an invitation to create one and claim his dive when it is finished. Based on the Dive Supervisors actions during a dive session, the DiveGuard application gathers all input data during the dive session and structures this information into an automatically generated divelog. An example is when the dive Supervisor click left surface. This action starts the counting of your bottom time. 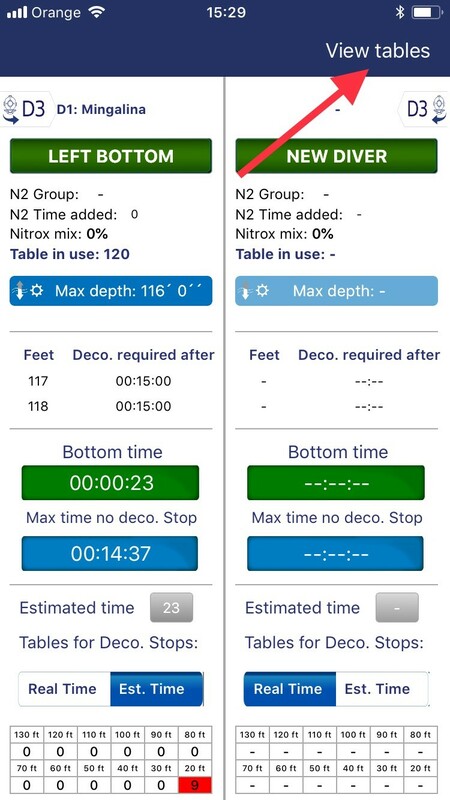 When the supervisor changes the max depth of the dive as the diver goes deeper, DiveGuard will change the table in use and show vital information such as how long the diver can stay before decompression is required. Once the dive has finished, DiveGuard synchronize the data with Cloudiver and connects it to the involved personnel`s profiles for further use such as statistics, printing logbooks etc. This way divers, supervisors and contractors can instantly view their diving data updated without writing any manual logs themselves. Is there any alerts in DiveGuard? DiveGuard will sound an alert if you forget to pay attention to the clock while doing decompression etc. but there are no alerts for non-vital functions such as example “arrived bottom”. How do I create planned dives? The easiest way to create planned dives for example next day is through Cloudiver, choosing dives and then add new dive. You can also do it through Diveguard by choosing new dive, and then after completing the input data (operational, personnel 1 & 2) clicking save. Why do I need to take the DiveGuard supervisor course? If you want to run dives in the application you will need to do the course. Don`t worry its only a couple of minutes and then you`re ready! What is important to remember when using DiveGuard? DiveGuard is a tool for use on a device connected to Internet such as a tablet, phone or similar. Keep device connected to Internet. If device is not connected to Internet it will not synchronize data such as N2 group, latest dives etc. Make sure to always use the same device for all dives if no internet connection can be established. Always use a device that is not busy. We recommend not to use other applications at the same time and try to not minimize the app while running dives. Use a designated tablet or similar for DiveGuard always as a phone may contain a lot of distractions. Stay focused. Don`t perform other tasks while running a dive. Although DiveGuard does a lot automatically it still require you to perform actions. Take your time and do it right. All applications require training and knowledge in order to work in the intended way. Take your time to learn how the application works and you will discover how helpful it is. How do I set or change max depth? Click on the max depth button and set the new depth. This can be done at any time until your diver leaves bottom. How do I view a completed divelog? Click on Planned/Finished Dive in the application. Select Finished Dives, choose the date and dive you wish to see. Why do I need to Configurate diver (minutes and depth) before I can start the dive? In order for the application to provide you with some estimated data and give you control at start of your dive you need to select what is your planned depth and duration. If you don’t set any time or depth and simply click done, the application will set your depth to the lowest possible. How do I create a new dive? If no planned dive has been created, Choose new dive from the front page of the application and fill out required input data (Operational, personnel 1 & 2) and then click start. You can also do this process by selecting projects. Can I leave decompression stops before clock has counted down? No, DiveGuard will not allow you to leave stop until clock has counted down to 00:00 at your stop. Does DiveGuard adjust for Nitrox mix or EAD? Yes, depending on the mix you select DiveGuard will calculate the table in use for your dive. Why does not the bottom time stop counting? If the bottom time continues to count it is because you have not clicked the action button “left bottom”. What does the abbreviations used mean? What is considered decompression time? DiveGuard follows the tables strictly. The decompression time is time you have to stop at a certain depth when returning to surface in accordance with the tables. Depending on which table you are using there might be differences in what counts in this time. An example is that for some tables the time you spend ascending bottom to first deco stop does not count in the decompression stop time, while the time spent ascending between stops does. Does DiveGuard adjust for repetitive dives? Yes, you will at all times be able to see the current N2 group letter next to your divers name or in the dive session screen along with any time added. What happens if I forget to push action button (Left surface, Arrived bottom etc.)? DiveGuard is depending on your actions to generate the divelog and collect the correct data. If you do not push the buttons you will not be able to progress correctly through your dive. It is therefore important that the Supervisor is focused and pay attention, always ready to push when diver performs an action such as for example leave bottom. Why is it not possible to start a dive without completing certain fields? In order for DiveGuard to produce a complete divelog from the dive you are performing certain information must be completed. The mandatory fields are what is considered to be mandatory for any commercial diving operation, while items such as Decompression Chamber may not always be present at the site. Why does a Letter appear next to the divers name? If a letter appears next to the Divers name this means that the diver has a residual Nitrogen Group letter and any use of this diver will be considered a repetitive dive, adding time in accordance with tables. What is included in the Basic subscription? A basic subscription gives you the possibility to enjoy Cloudiver and our Diveguard application in your daily diving activities. A basic profile lets you view your updated statistics and dive logs on your device at all times. A basic profile allow you to add and communicate with as many of your friends as you want as well as viewing and improving your ranking. You can also let Cloudiver keep track of your certificates and develop your virtual CV. You will always know when your last dive was, and when is your next one. Whenever your medic or certificates are about to expire Cloudiver will send you a message if you have uploaded them to your profile. If you need to run dives and have the role as Dive Supervisor when using our Dive Guard application you can still do this with a basic subscription, but you will need to perform our Dive Supervisor course in order to obtain the permission to run dives. If you wish to organize your dives in a logbook you will not be able to do it without upgrading to premium. Then you can order one through the Logbook module and the dives appear in the book verified and stamped. Another function not included in the basic subscription is the DiveJobs module. If you wish to have access to our easy job search functionality and be listed as available for contractors looking for divers you will need to upgrade to premium. What is included in the Premium subscription? A premium subscription of course has all the features of the basic subscription but in addition it allows you to systematically develop your professional career. With premium you get access to our DiveJobs platform where you can stay visible for any contractor looking for divers or you can search for available jobs posted. When something of interest comes up you can connect and share the information vital for both you and the Contractor directly from your diving history and Virtual CV removing any need for manual work, sending e-mails, excel sheets and attachments between you and the Contractor. In addition to your ranking and recommendations a good updated profile will reduce the efforts required by the Contractor making it attractive for them to include you on the team. What is included in the Enterprise subscription? Our Enterprise subscription is customized for diving contractors and provide many tools to minimize the administration involved in diving operations and automate the processes. The subscription allows you to access all diving data from your projects collected when using our DiveGuard app in your operations. You will have constantly updated statistics available, systematically stored and ready to be exported. At any time you can issue fully updated reports of diving exposure data in your individual projects, for individual divers in your company or weekly, monthly or yearly reports for the whole organization. Our reports are developed to fulfill strict standards such as NORSOK or IMCA allowing your business, however small, to have full control and present documentation at the highest level to your clients with almost no efforts. When do I have to pay for Cloudiver? Basic users can use Cloudiver and DiveGuard for free. If you have a Premium or Enterprise subscription you will be charged your subscription amount every month from the date of your initial payment. What happens if my payment does not go through? If we try to charge your subscription and the transaction does not go through we will send you a notification in order for you to check. If you don’t tell us anything we will try again during one week. If we are still unsuccessful we will downgrade your profile to basic. All your data will still be there, and you can at any time activate your subscription again under your account settings. Can I pay by bank transfer or can I get an invoice? No, Sorry. We only accept credit card payment. What kind of creditcard can I use? You can use all traditional type of credit cards. Do I get a receipt when you charge my account? We do not send receipts but you can find your payment history, and print a receipt if you need one under your profile, account settings. If you do no longer wish to be a Premium or Enterprise user you can at any time cancel your subscription under your account settings. We will then proceed to downgrade your profile at the end of the current paid month. Why do I need to become DiveGuard Supervisor? If you have plans to run dives in the DiveGuard app you will need to take the course. If you need to verify dives on behalf of divers you will also need to take the course. Please note that to verify dives one must have a valid premium subscription. Will the Dive Supervisor course make me a Dive Supervisor? No, the course is meant as training in use of the DiveGuard application and does not in any way replace the need for Dive Supervisor education required in the region where you plan to run your dives. Make sure you also have the right certification or competence required to run the dives. Will I get a diploma or a certificate from the course? No, you will only get your profile updated with a new title as DiveGuard Supervisor. You will also appear for the Contractors looking in DiveJobs as a DiveGuard Supervisor confirming your knowledge in running dives on the DiveGuard application. All the data from your diving logs is stored in Cloudiver. This information is amongst other things used to provide you with the statistics shown in your profile dashboard. How do I export the statistics? Users can view their statistics information on dashboard screen, and see their individual dives under “my dives”. Basic users are not able to export data. Premium users can in addition to ordering logbooks print and download their individual dives under “my dives”. Enterprise users can print or download individual dive logs under “my dives” and export key data reports such as weekly or monthly statistics report from their dashboard. For how long will the statistics be available? Your history will never be deleted. This means that all your dives and statistics will always be available as long as you keep an active profile with us. How do I add old dive logs? Only Enterprise users/ contractors can add dive logs manually. Go to Dives, click the Add Dive Log button. Select project you wish to connect it to. If you don`t have a project you will need to create one first and fill in the rest of the information of the dive. You can add as much as 3 divers to the same session. click on the link icon to find and attach Log to the correct diver. if he does not appear, you can write his e-mail and he will receive an invite to claim the dive log. Why does not my last dive appear in my statistics? In order for a dive to appear in your dashboard statistics it needs to be verified as real by either the contractor (enterprise user) or your supervisor. Go to Dives in the menu or directly from the dashboard by clicking Dives in order to see the status of your dives. What statistics can I see? In your dashboard you will see all the latest statistics from all verified dives sorted by year shown as a graph. Above the graph you can see your total dives in your history and how many of them have been done this week. We also included in top of your dashboard the possibility to see the number of projects and clients (Enterprise users), or total projects this year (Regular users). There is also a section where you can see the amount of divers and supervisors you are have currently within your company (Enterprise users), or total companies you are working for (Regular users). You will also see the total time spent in water this year. Where can I see my dives? You will find all your dives under Dives in Cloudiver menu or from the dashboard by clicking Dives. All verified dives will also appear in your statistics. Who can change or delete a dive? Supervisors with Premium subscription and enterprise users can change or delete dives. If you change data from what has been recorded through the DiveGuard application the changes will appear in the change history log under the individual dive. Change history log is a way to keep track if someone changed the data in a divelog. In principal the DiveGuard application will log everything, but in case of errors, failure such as power loss on device or other cases there might be a need to input manual data to complete a diving log. All changes done after the dive was completed in the DiveGuard Application will be logged and will appear in the list of changes. Who can verify a dive? Why do I need to verify a dive? For the dive to be considered approved and to confirm that the data is real an independent user from the diver himself is required to verify it. A dive that has not been verified will not appear in any statistics and cannot be exported. It is therefore important that you verify dives frequently so all statistics are updated. If you are asked to verify a dive it is because your user has been selected as Dive Supervisor for the actual dive, or your user has an Enterprise profile. Cloudiver request the Contractor (Enterprise user) to verify dives also and if dives are exported the company logo will then appear as a stamp on the log. How do I create a new planned dive? Go to Dives in the menu or directly from your dashboard and click the Add new dive at the bottom of the page. The function of creating planned dives is intended to provide Diving Superintendents, Supervisors and management a possibility to develop dive plans efficiently. Adding a new planned dive through Cloudiver will push the dive into the system so it is ready in the DiveGuard app if the device is connected to internet. Insert basic information such as where the dive will take place (diving station) and description of the work as well as who will be participating in the team. The diver who is listed as diver will also have the planned dive appear in his profile so he can prepare for it. Planning dives also saves the Supervisor time having to input all this data on site. Who can create or edit projects? It is only Cloudiver Dive Supervisors (those who have completed the course) and Enterprise users that can create or edit projects in the system. How do I assign people to the projects? There is several ways to assign people to your projects. If you have created a job offer and accept someone`s application they automatically get assigned to your project. The same way will apply if you browse available divers and they accept your offer. You can also assign your own divers, frelancers or supervisors by selecting the actual project and click assign personnel. Here you can choose from the lists available in your profile. Go to Projects from the menu or Dashboard directly by clicking projects. Click on the change button (pencil icon) next to the project you wish to assign people to. How do I remove people from the projects? To remove people from the project you simply need to select Project from the menu or directly from the dashboard. Find the actual project and then click the delete button (trashcan icon) next to the person’s name. How do I print a crew list from a project? To print a crew list find your selected project under Projects in the menu or access directly from the dashboard by clicking Projects. Once you have opened the project you will find the print button at the bottom of the list of personnel, at the bottom of the page. How do I download a crew list from a project? To download a crew list find your selected project under Projects in the menu or access directly from the dashboard by clicking Projects. Once you have opened the project you will find the download button at the bottom of the list of personnel, at the bottom of the page. Do I need to create projects? No, but Cloudiver and DiveGuard works in the way that it structures the information into projects to sort the information and assign divers etc. to it. It also helps those who need project specific reports etc. If you don’t use projects in your daily activity don’t worry.. If you don’t create one all dives and collected data simply end up under the default project and client. How do I create projects? Go to Projects from the menu or directly from your dashboard and click the add project button on the bottom of the page. What kind of reports can I create? Cloudiver allows you to issue statistics reports containing all verified data at any given time. This means that you can set the report from-to within any range you choose and for any projects or all of them. Typical reports that you can generate through Cloudiver would be daily report, weekly report, monthly report, Yearly report, or end of project statistics report. To export reports one is required to be an enterprise user. The reports are easily exported from your dashboard by selecting the type of report or by selecting a date range to-from. How do I order a logbook? In order to order a logbook you have to select logbooks from the menu or directly from your dashboard or other shortcuts within Cloudiver. We do recommend that you complete your profile, as the information from your profile is included. Simply click Logbooks, choose type, add date range and type of dives to be included. Can I select only some dives in a specific period for my logbook? Yes, you will be able to select between verified, unverified dives and the period to-from. All dives selected within the period will be included in your book once you confirm the order. Who can order a logbook? All members with Premium subscription can order logbooks. Can I customize my logbook? Yes you can. The logbook can be customized with a special front page at an extra cost. You will have the option to personalize your book by adding a special picture and to the cover. The contents of the book however cannot be customized. What information comes in the logbook?